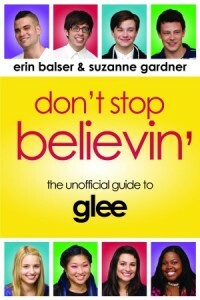 Introducing the Glee Quote Generator! Every gleek knows that one of the best parts about Glee is the fantastic dialogue. From hilarious one-liners, to poignantly touching moments, the show definitely has some great quotes. So, to celebrate the amazing Glee dialogue, Gleeks United is super excited to introduce the brand-new Glee Quote Generator, allowing us all to show off our gleekiness on our blogs! 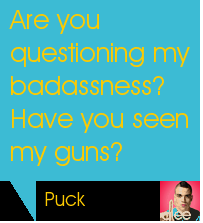 You can check out the quote generator in action in my sidebar, and visit this link to get the code so you can have your very own version for your blog, fan site, e-mail signature, or wherever you want to show off your gleeky status! Just copy and paste the code right into your blog, and you’re good to go! Super-duper huge thanks go out to Mo Jangda for building and designing the quote generator, and to Jen Dibble for helping me add in all of the quotes! And don’t you worry, gleeks, I’ll be adding more amazing quotes as time goes on, so it’ll keep on getting better and better! Hi there! Thanks so much for the nice comments! I took a look at the pic you’re referring to, and that’s actually from the original screener version of the pilot episode. The director’s cut of the director’s cut, if you will, totally unedited and with all the scenes. Those are the outfits the McKinley glee club won Nationals in back in ’93 with Will, and the club is too poor to buy new outfits! Fortunately they come up with the red t-shirt, jeans, and black Converse sneakers outfits instead by the end of the episode! How do you get this into your blog? Thanks. I’ve added the countdown clock to the sidebar of my blog. I have a question what if you don’t have a wordpress blog can you still do it?